Creativity—in the forms of both imaging science research or quilting—comes easily for Kim Kolb, a graduate student in the Chester F. Carlson Center for Imaging Science. Go to kimkolbquilts at www.Etsy.com to see her quilts, decorations and accessories. Kolb, a graduate student in RIT’s Chester F. Carlson Center for Imaging Science, arrived in time for the Scientific Detector Workshop on Oct. 4 to share findings about an imaging system that could bring higher sensitivity and clearer vision to space missions. Imaging arrays of Geiger-mode avalanche photodiodes, or GM-APDS, count each photon, or unit of light, carried in an “avalanche,” or a flurry of electrons. The technology was developed at Massachusetts Institute of Technology Lincoln Laboratory and advanced in partnership with RIT’s Center for Detectors in the College of Science with funding from the Gordon and Betty Moore Foundation. Kolb spent the summer testing and characterizing the devices in the RIT Center for Detectors. In September, she and her colleagues irradiated three of the detectors at Massachusetts General Hospital Francis H. Burr Proton Therapy Center to imitate the damaging effects of space. The posters Kolb presented in Florence, and the paper published in the conference proceedings, describe those results, which measure the usability of the radiation-damaged detectors. linear-mode avalanche photodiodes and electron-multiplying charge-coupled devices. But most of her original work and contributions will have to do with the GM-APDS, Kolb says. Her dissertation will recommend the best single photon counting device for specific NASA applications, including the detection of exoplanets—or Earth-like planets outside our solar system—high-contrast imaging, adaptive optics and array-based LIDAR. Kolb initially joined the Center for Detectors as a senior undergraduate in the microelectronics program. 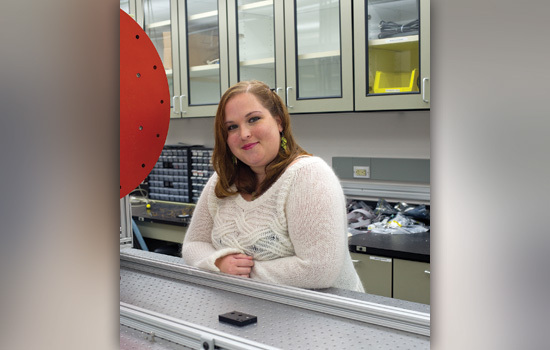 After gaining industry experience, she returned to RIT on a fellowship from the military contractor BAE Systems to pursue a master’s degree from the Center for Imaging Science. Results from Kolb’s research on the Geiger-mode photodiodes will further the center’s bid to develop technology suitable for NASA exoplanet missions and to uncover the physics behind mysterious dark matter and the universe-accelerating force dark energy.